UPDATE: The company has reversed its position. Update 07/9/14: After two days of minor controversy, the company has officially reversed that decision. 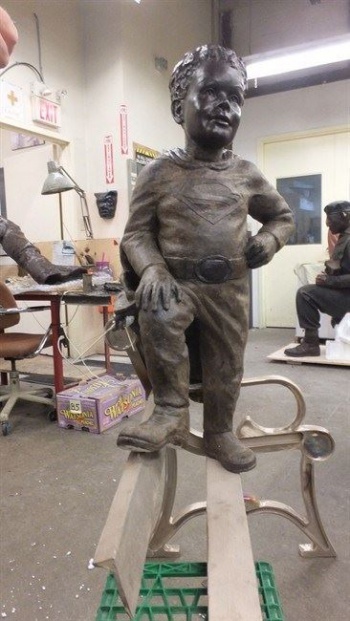 by The Toronto Starhas reported this morning that DC will allow the statue to be made as originally designed. "DC Entertainment uses a flexible set of criteria when we receive worthy requests such as this, and at times have reconsidered our initial stance," a DC spokesperson said in a press statement. "After verifying the support of appropriate family members, DC Entertainment will be allowing the Jeffrey Baldwin Memorial Statue to feature the Superman 'S' shield." Prior coverage of this story continues below. Update: While DC still hasn't provided an official statement, its communications with Boyce have been quoted by The Toronto Star. An email, attributed to DC's senior vice-president of business and legal affairs Amy Genkins, states that "for a variety of legal reasons, we are not able to accede to the request, nor many other incredibly worthy projects that come to our attention." While still somewhat vague, the tone of the email does suggest more sympathy on DC's part than other stories have implied. We will keep you appraised of further developments. Original Story: In 2002, five year-old Jeffrey Baldwin died from complications caused by malnourishment and years of abuse from his grandparents and caretakers. His death was horrendous and tragic, which inspired IT worker Todd Boyce to have a memorial statue made in his honor. Learning of Baldwin's love of Superman, Boyce decided that the statue should bear his favorite hero's symbol when it was erected in Greenwood Park, Toronto, this year. Unfortunately, according to Boyce, DC Entertainment refused the logo's use on the memorial. "Basically they didn't want to have the character of Superman associated with child abuse. They weren't comfortable with that," Boyce told The Canadian Press. "To be fair to DC I don't think they wanted to say no. I think they gave it serious thought." Upon hearing more of Jeffrey's life, and seeing a picture of the boy in a Superman costume, Boyce immediately decided to integrate it into the statue. The memorial, in its current form, depicts Baldwin wearing his Superman costume while standing proudly on a park bench. Boyce now claims, however, that the request was turned down by DC representatives on the grounds that it's in poor taste. "He wanted to fly," Jeffrey's father, Richard Baldwin, later testified. "He tried jumping off the chair. We had to make him stop. He dressed up (as Superman) for Halloween one year ... He was so excited. I have that picture at home hanging on my wall. He was our little man of steel." While the story paints DC in a severely unflattering light on the surface, intellectual property holders do face the risk that unlicensed use of products can undermine copyright ownership. Disney famously stopped three Florida daycare centers from using Disney characters in murals in 1989 for this very reason. Further, and more relevant here given the reason claimed by Boyle, while what happened to Jeffrey Baldwin was horrific, it makes some sense that DC would be incredibly reluctant to link the event to one of its biggest characters. That being said, DC Entertainment has previously allowed for its intellectual properties to be used by the Make-A-Wish Foundation. Further, Superman's likeness has in the past been used to commemorate real-world deaths, and DC has also published stories addressing child welfare issues directly. It must also be noted that so far DC has not responded to media requests regarding this matter, and all accounts of this story are derived from the original article published by The Canadian Press, which relies exclusively on testimony by Boyce and by Jeffrey Baldwin's family. Which is to say, this story ought to be approached with healthy skepticism until DC issues a statement. We've reached out to DC Entertainment for a statement, and will update this story with any new information. Regardless, the important factor here is to acknowledge Jeffrey at his happiest, not dwell on trademarks, and Boyce seems to agree. "(I) realized that the most important thing is to have a fitting monument for Jeffrey, that it's about him," he said. In response, he will change the letter on Superman's logo from an "S" to a "J" before it is cast in bronze for a September unveiling.